I've got one for Stock Appearing. Ran 10.5's last year, but I went from GTX3576R to GTX3582R this year for more power! Made another 75WHP or so via more boost pressure and a nice 4" intake. Here is the first pass out at the last import event in April. BlueX / 4/07/13 / ATP Turbo / Evo X / ATP GTX3582R, pistons, rods, cams, E85, Hoosier DRs, 38 PSI / 10.579 ET (tagged the limiter on this pass due to running out of gear). 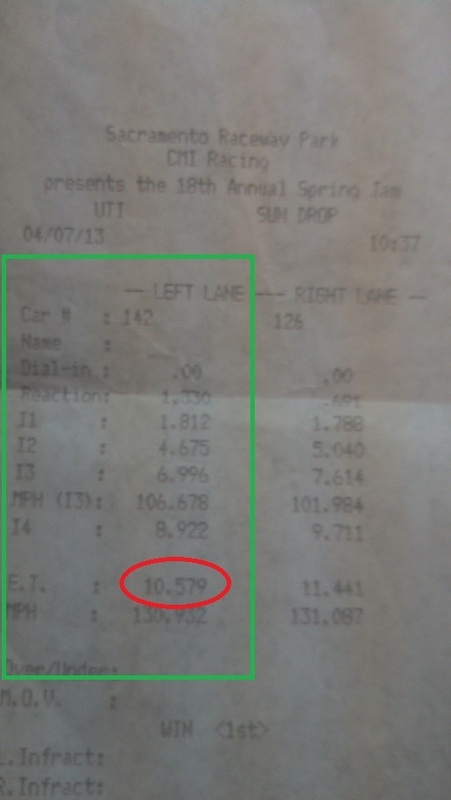 Highest trap is 138.35MPH but on the 10.6 run. Great Pass. You need a pic of the car with your car number on it or a vid of it going down the track with the time as well to be added to the list. It stops some of the phonies from just grabbing random pics from offline and posting it as there own which unfortunately has happened before. Last edited by Darksun280; Jun 6, 2013 at 03:05 PM. Seriously though Blue those are some bad *** passes. you are running the times I'm trying to get. I'll look for some more. for now I'm going to put you at spot number 4. I haven't researched for gumps whole slip so you are faster unless something else changes. Last edited by Darksun280; Jun 7, 2013 at 07:19 AM. 10.5 @ 128 only...man I am doing it wrong. That makes me realize how bad I am at driving. I am totally going to rock the high 11's at 130+ this year haha. Just gotta bang those gears dude! 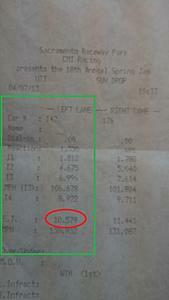 What you got there is fine for the 10.51 run. Thanks. I've got enough power now to get to the #2 spot at least. Just can't get traction. 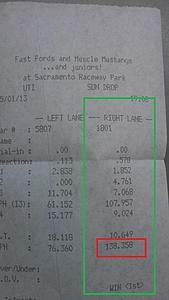 The 128mph is deceiving because the car actually hits 135 mph about 30 - 40 ft before the finish line, then it will bangs the limiter and decels until it crosses the traps. 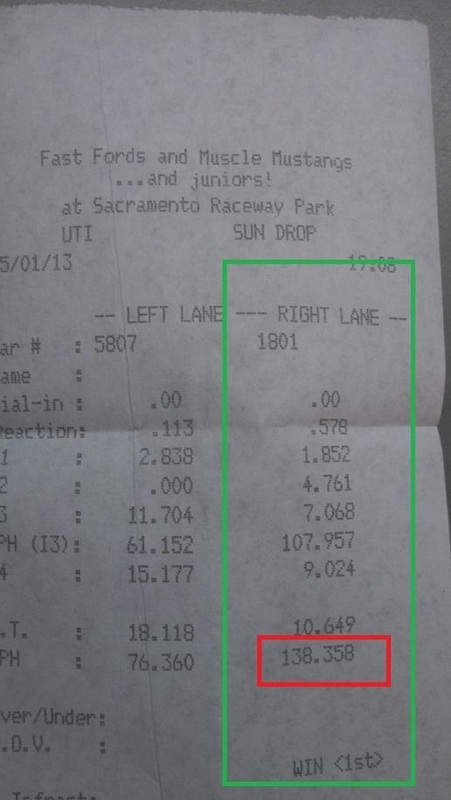 4th gear is just all topped out even at 8800 rpms. gotcha. I updated the main, 2013, and GSR stock appearing lists. Bro I didn't even know a guy like you still existed all these years. I was ultimately kinda of chasing Gumps time in the back of my head but that felt like I was playing mario kart 64 and chasing a phantom since his car is long gone and he's not around. Funny enough I never found you cause you were mixing it up with the 8&9 boys lol. I can't lie you are my new target but that's cause you are out there putting in work with your machine. Guys like you keep guys like me motivated to go faster. Post up more and hang out. I'm trying to wake this X drag racing game up in the coming months. Wish you were closer to this side of the country Buschur shoot out is coming up in Aug we could use the help against the big boys. Last edited by Darksun280; Jun 7, 2013 at 01:06 PM.